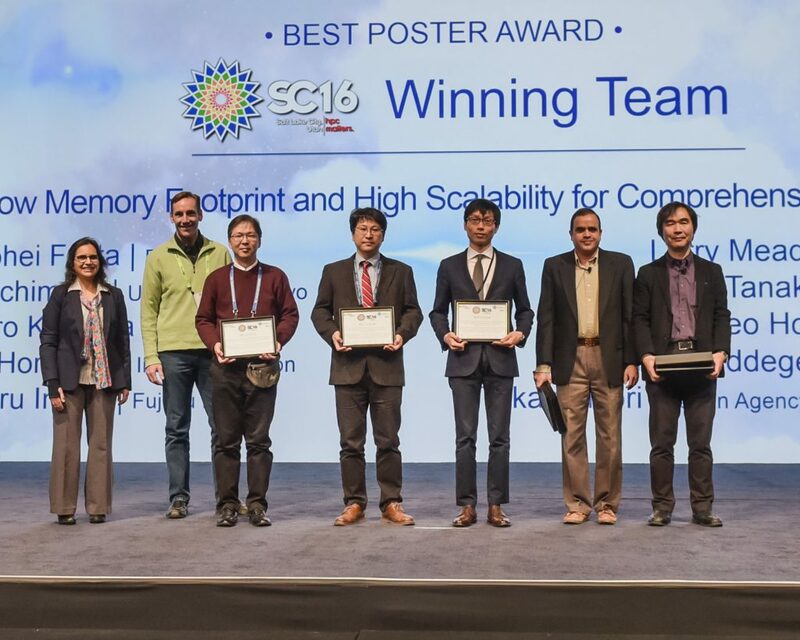 The winners of the 2016 Best Paper, Poster and Scientific Visualization Awards were announced during the SC16 Awards Ceremony on Thursday, November 17, 2016. SC16 received 442 paper submissions, of which 81 were accepted (18.3 percent acceptance rate). Of those, 13 were selected as finalists for the Best Paper (six) and Best Student Paper (seven) awards. 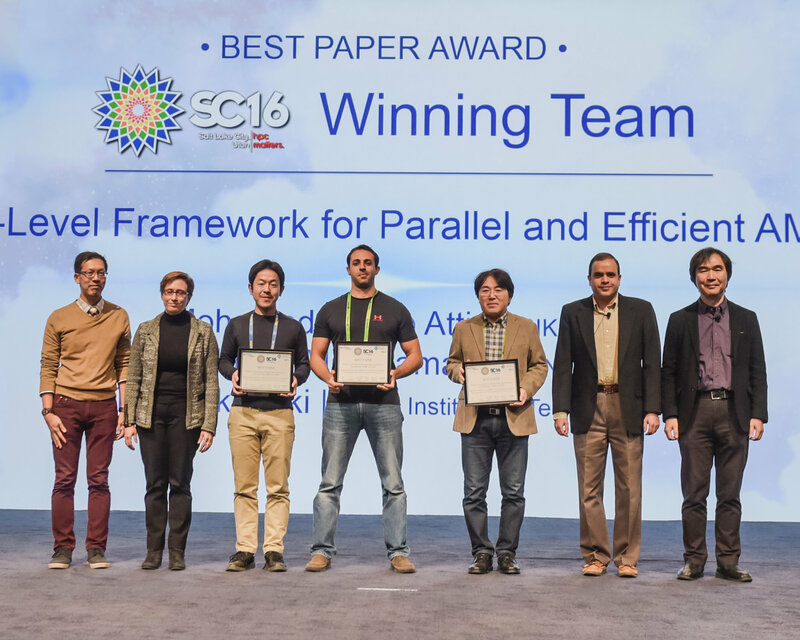 The Best Paper Award went to “Daino: A High-Level Framework for Parallel and Efficient AMR on GPUs” by Mohamed Wahib Attia and Naoya Maruyama, RIKEN; Naoya Maruyama, RIKEN; and Takayuki Aoki, Tokyo Institute of Technology. 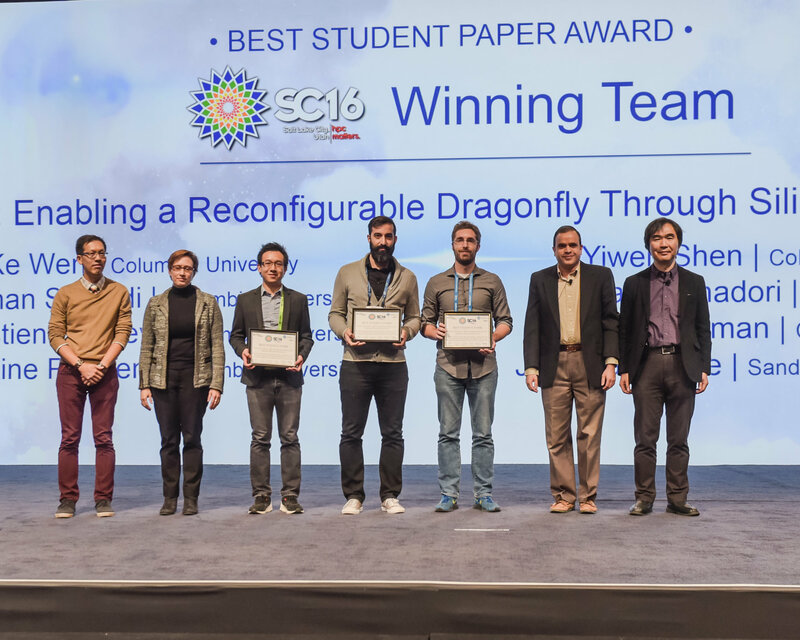 The Best Student Paper Award went to “Flexfly: Enabling a Reconfigurable Dragonfly Through Silicon Photonics,” by Ke Wen, Payman Samadi, Sebastien Rumley, Christine P. Chen,, Yiwen Shen, Meisam Bahadori, and Karen Bergman, Columbia University and Jeremiah Wilke, Sandia National Laboratories. This year, SC received 172 detailed poster submissions that went through a rigorous review process. In the end, 112 posters were accepted and five finalists were selected for the Best Poster Award. 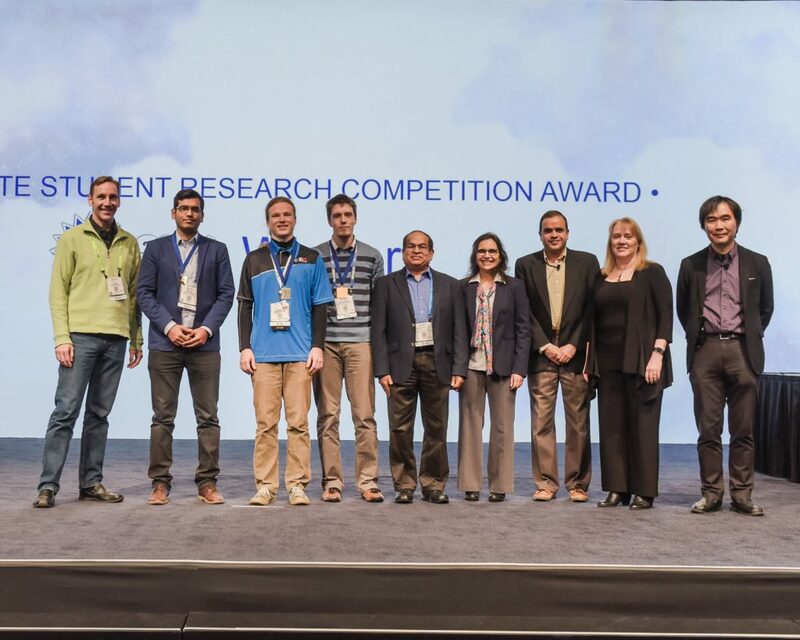 As part of its research poster activities, SC16 also hosted the ACM Student Research Competition for both undergraduate and graduate students. 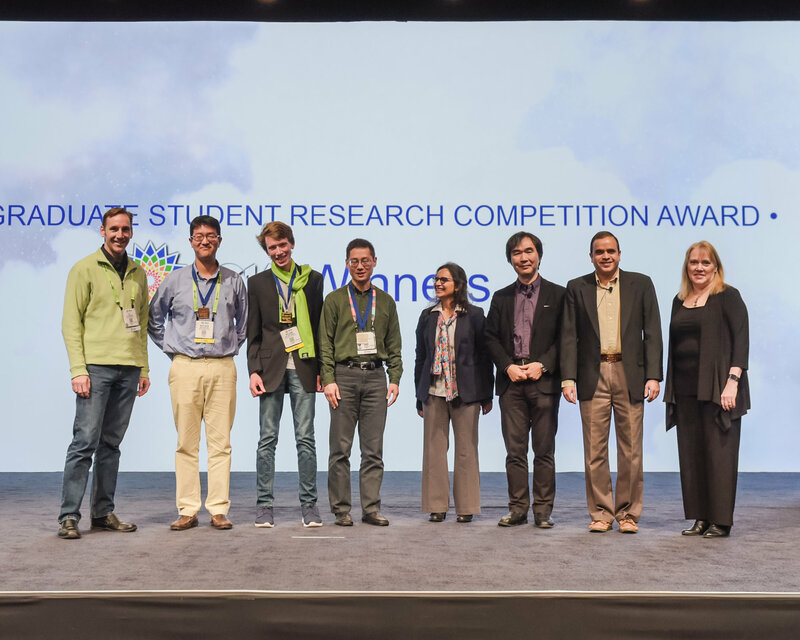 In all 63 submissions were received, 26 Student Research Competition posters were accepted – 14 in the graduate category and 12 in the undergraduate category. The Best Poster Award went to “A Fast Implicit Solver with Low Memory Footprint and High Scalability for Comprehensive Earthquake Simulation System” by Kohei Fujita, RIKEN; Muneo Hori, Tsuyoshi Ichimura, and M.L.L. Wijerathne, University of Tokyo; Takane Hori, Japan Agency for Marin-Earth Science and Technology; Masashi Horikoshi, Intel K.K. ; Hikaru Inoue and Kentaro Koyama, Fujitsu Limited; and Larry Meadows, Intel Corporation. First Place: “Touring Dataland? Automated Recommendations for the Big Data Traveler” by Willian Agnew and Michael Fischer, Advisors: Kyle Chard and Ian Foster. Second Place: “Analysis of Variable Selection Methods on Scientific Cluster Measurement Data” by Jonathan Wang, Advisors: Wucherl Yoo and Alex Sim. Third Place: “Discovering Energy Usage Patterns on Scientific Clusters” by Matthew Bae, Advisors: Wucherl Yoo, Alex Sim and Kesheng Wu. First Place: “Job Startup at Exascale: Challenges and Solutions” by Sourav Chakroborty, Advisor: Dhabaleswar K. Panda. Second Place: “Performance Modeling and Engineering with Kerncraft,” by Julian Hammer, Advisors: Georg Hager and Gerhard Wellein. Third Place: “Design and Evaluation of Topology-Aware Scatter and AllGather Algorithms for Dragonfly Networks” by Nathanael Cheriere, Advisor: Matthieu Dorier. 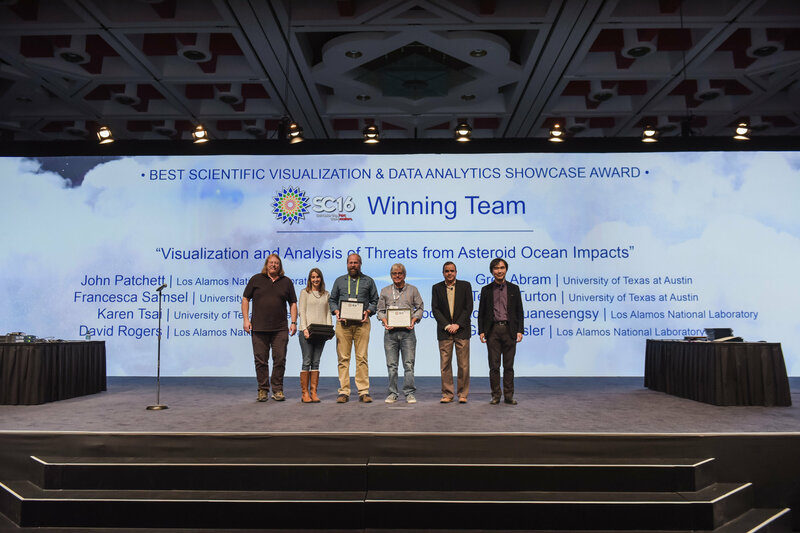 The Scientific Visualization and Data Analytics Award featured six finalists. The award went to “Visualization and Analysis of Threats from Asteroid Ocean Impacts” by John Patchett, Galen Gisler, Boonthanome Nouanesengsy, and David H. Rogers, Los Alamos National Laboratory; Greg Abram, Texas Advanced Computing Center; and Francesca Samsel, Karen Tsai, and Terece Turton, University of Texas at Austin.